Omen: A Reign of War | SPACE-BIFF! Some of the cards that come with Omen (click for bigger). Ordinarily I’d go straight into The Board Game Box Review, but I can’t help myself—the artwork by Michael “Riiven” Ng and Justin Hernandez is incredible. The hunkiness of the champions is so well illustrated that I’d swear the artist’s goal was to remind you of how unmanly you are. The oracles are exactly as flustering as you imagined back when your dad got you that book on Greek mythology for your twelfth birthday, and the mythological beasts are wreathed in shadow and magic and mystery. This does wonders for bringing the theme to life, because when you summon a soldier, he’s no mere fighter; he’s a Seaside Guardian, glistening in sea-damp armor and carrying a ridiculous golden trident and tower shield, or a Grizzled Veteran complete with worn and chinked armor. The images are also distinct enough that I found myself remembering the various unit abilities rather quickly (except for the oracles, many of whom share the same color scheme). There are certain games out there that are recommendable on their art alone, and Omen would be one of those if the gameplay itself weren’t so good. Our storage solution for the cards: two deckboxes. Before we talk about that gameplay, let’s briefly touch on The Board Game Box Review. As with Hemloch, the box is beautiful and sturdy but too big, causing the components (mostly the cards) to rattle around more than I’d like. This was even worse with Omen because the box is significantly bigger than Hemloch’s, though there’s also a fair bit more to fit in Omen. We fixed our storage problem with two deckboxes (and one for Hemloch). Overall, the box gets ★★ (out of three). Good, but not great. The game setup (click for bigger). The game setup is nice and simple. 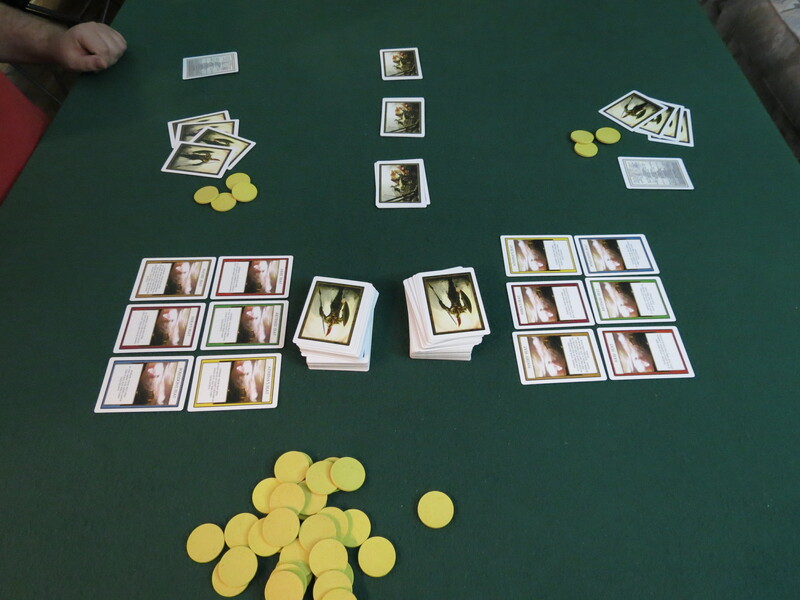 Two players sit opposite one another, with three stacks of four fortune cards between them. Each of these three stacks is a city, and it’s into these three locations that you’ll be playing your units. 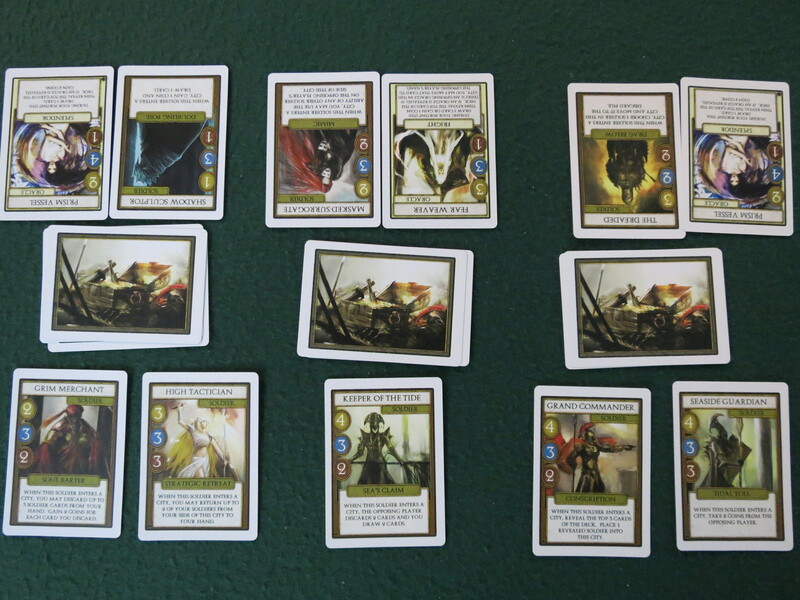 Additionally, you both have six face-up feat cards in front of you, as well as a hand of four unit cards and four coins. Between you sits the draw deck. Your goal is to have the most points at the end of the game. You receive 2 for each accomplished feat, and more by looting fortune cards from cities, though these fortune cards provide an extra layer of consideration as you can either hold onto them for 2 points or use them for powerful bonuses but a reduced score of 1 each. The game is then played in six phases. The wealth phase sees you drawing cards or taking coins. You get 3 wealth actions, each of which can be used to draw a card or take a coin. The twist is that if you use all three actions on a single option, you can take four of that thing. So planning ahead for that bonus card or coin can be highly beneficial. This deceptively simple phase contains most of Omen’s gameplay: All you do is select unit cards from your hand, pay their gold cost, and play them into cities. Each of these units has three number values, representing their cost, offering value, and strength. You can play as many cards as you can afford, but each city can only sustain five units. Soldiers are the most common unit type, and their abilities activate when they enter a city. This means that they not only activate when you play them, but also if they’re moved to another city—and there are plenty of cards that will let you do just that, potentially chaining their actions into combinations that will leave your opponent glowering at the table. Oracles are weak, but act as economy cards and generally give you per-turn bonuses during the portent phase, which we’ll talk about in a second. And beasts present you with a choice: You can either play them into a city, where they will contribute massive strength values but count as two units, or you can pay to discard them and activate their powerful abilities. During your portent phase you go through each of your oracles and resolve their abilities. As I mentioned, they usually bestow economic bonuses like cards or coins. You also reveal a card from the deck for each oracle, activating their secondary ability if the revealed card is an oracle. This adds a dash of chance to Omen, as some of the best—or most harmful—oracle abilities are left up to a gamble. In one game, I took a risk by playing a Peril Peddler. She gave me a neat 2 cards or 2 coins per turn, and for a while she was benign and helpful. Later, an oracle card was drawn during her part of the portent phase, activating her secondary ability. As misfortune (and my poor foresight) would have it, this meant that she was now blocking me from taking a later phase that I direly needed. 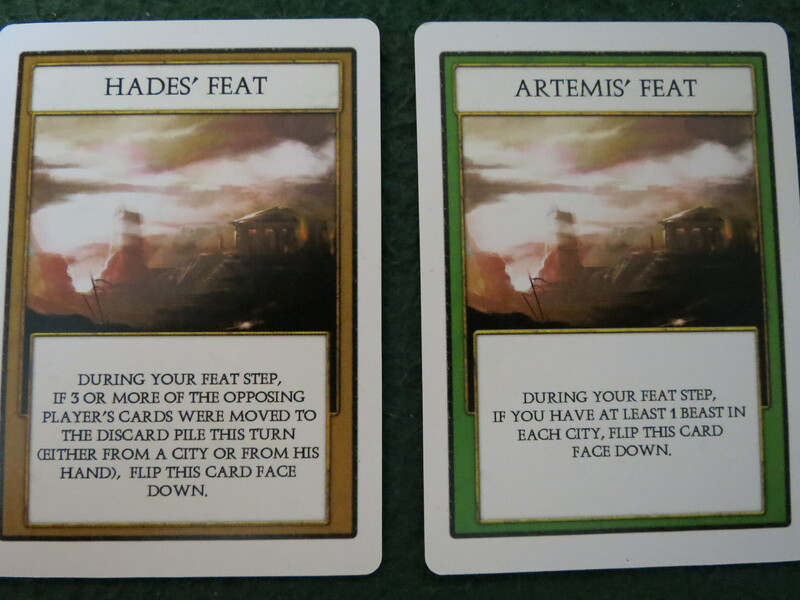 Two of the six feat cards. Now you check to see if you’ve accomplished any of your feats, flipping them face-down if you have. These are worthwhile goals to strive towards, and much of your strategy will revolve around turning over as many of these as you can while blocking your enemy from doing the same. Checking for war seems unintuitive at first, but it’s actually a pretty smart mechanic. A city is war-torn if it contains five total units (and remember that beasts count as two) or if your enemy has three units there. Both sides count up their strength value, with the victory going to whoever has the highest total. The winner takes a reward card and discards down to 1 unit in that city (meaning that you can never keep a beast in a city after winning) and the loser discards down to 2. In practice, this lets both players conflict over when and where battles will actually take place. It’s even often a good idea to not place more units in a city to prevent your opponent from beginning a battle on his next turn. Furthermore, because winning causes the victor to discard down to 1 card, he will often be weaker than the loser, who can now fight for an advantage in that city. The last phase lets you select one of your units to sacrifice to the gods (read: the discard pile), giving you coins or cards equivalent to that unit’s offering value. This extra economic boost comes right at the end of your turn, giving your opponent ample opportunity to screw you over. 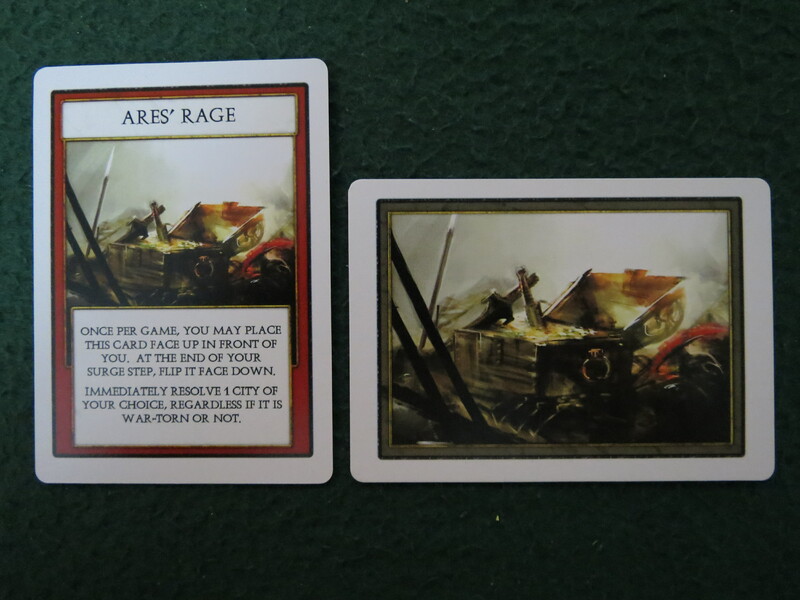 The game ends at the end of these phases if two of the three cities have been depleted of reward cards, or if your opponent has flipped five of his six feats face-down. A game in full swing. Most of the gameplay comes down to the way unit abilities resolve, which can be joyfully thematic if you let your imagination fill in the blanks. Having a scorned warrior creep into a city to assassinate a Soothsayer, or a Brazen Slayer display the head of one of your beasts (to use its ability without paying for it! ), or a Pegasus drop in with reinforcements, or any number of a hundred interesting combinations, can be an utter joy. If I had a single caveat for my admiration for Omen (and my wife is very insistent on this caveat), it would be that the luck element can be devastatingly strong at times. In our last game, she played a Keeper of the Tide and a Corrupted Hoplite on her first turn, discarding three of my four starting cards before I had the chance to act. Of course, that did make revenge all the sweeter when my Masked Surrogate copied her Keeper’s ability and my warrior (“The Dreaded”) dragged her Hoplite down to hell. Nonetheless, I don’t feel that this chance necessarily does the game a disservice. 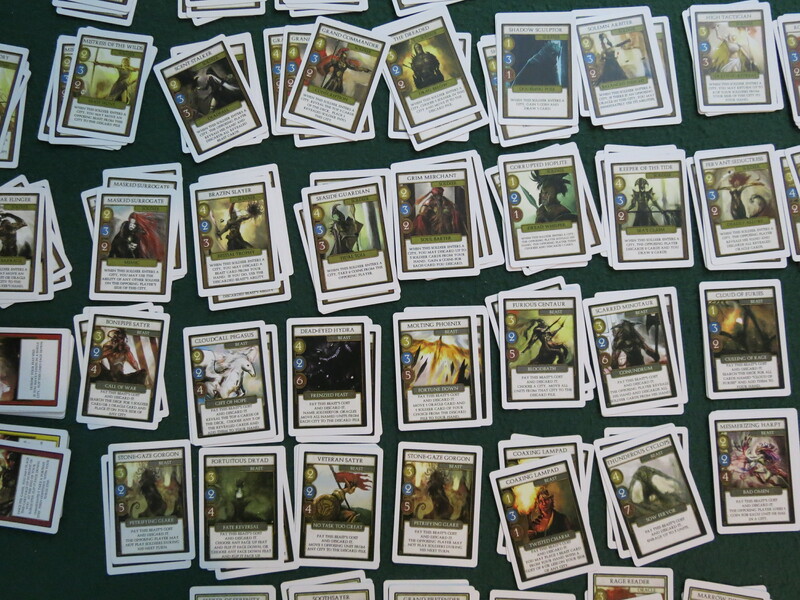 It’s true that sometimes one player is going to draw all soldier cards, or will fail every one of their oracles’ portent bonuses, or might be forced to discard an entire hand of beasts, but the game plays quickly and provides so many opportunities for swings in fortune that I don’t feel it’s a real problem. There are two modes that I suspect would dampen the effects of luck. 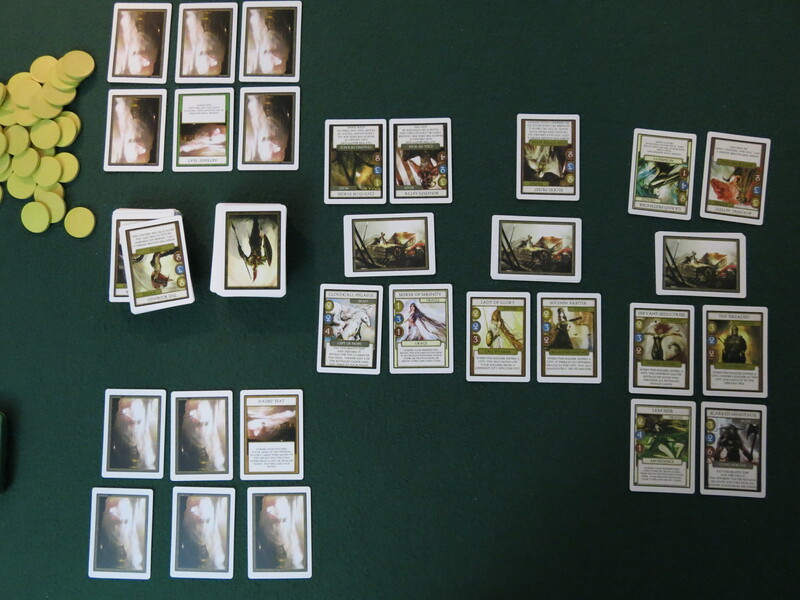 In one, both players have an identical deck of 50 cards, and the other is a draft version in which the 50 units are separated into 50 face-up stacks. The players take turns picking stacks until they’ve picked 10, and they can’t have more than 6 soldier, 4 oracle, or 4 beast decks. This means that half the game will be played before the battle actually begins, as players will be able to watch their opponent’s plan evolve as they pick cards. I hear this version is exemplary, but we haven’t played it yet because when we separated out the 50 units we were so overwhelmed that we immediately shuffled them back together and played a normal game. We’re definitely planning on giving it a try once we have a better grasp of the cards though. All in all, I find Omen: A Reign of War immensely enjoyable. As with Hemloch, Small Box Games has imbued Omen with loads of tough decisions and white-knuckle moments where you’ll hope your opponent doesn’t notice the opening that you saw the instant you finished your turn. Add that to some of the best card art out there, and it’s worthy of many (enjoyably brisk) sessions. Posted on August 31, 2012, in Board Game and tagged Board Games, Omen: A Reign of War, Small Box Games, The Board Game Box Review, The Fruits of Kickstarter. Bookmark the permalink. 6 Comments. And it was a sweet sweet victory. Pingback: I’m Fighting Tooth & Nail « SPACE-BIFF! Pingback: Together for the First Time: Stone & Relic | SPACE-BIFF! Pingback: The Other Defenders of the Realm | SPACE-BIFF! Pingback: Omen: The Value of Olympus | SPACE-BIFF! 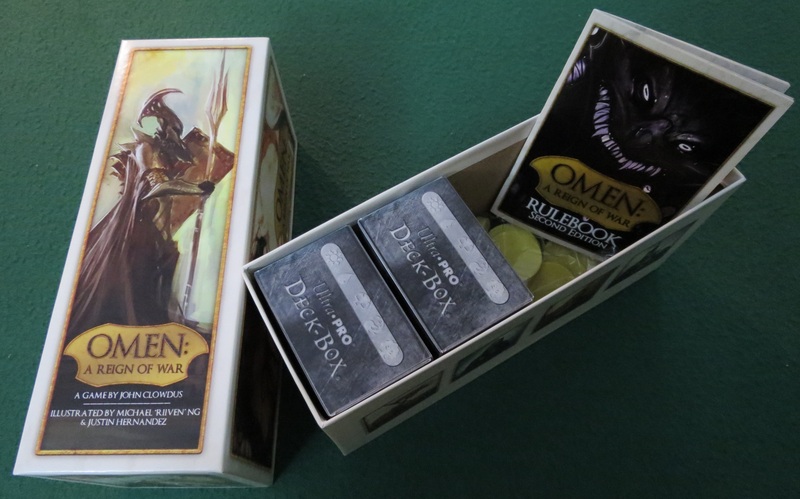 Pingback: Omen: Small Box Gaming Perfected | SPACE-BIFF!